"I have multiple images per product and WP-Lister generates a nice gallery further down in my listing description. How do I get my additional images to the top, right below the main image?" Images embedded in your item description are hosted on your website, while images at the top of the listings page have to be hosted on eBay's servers (eBay Picture Service aka EPS). While eBay used to charge for every additional image that is uploaded, they now allow up to 12 free images hosted on EPS on most sites and categories. 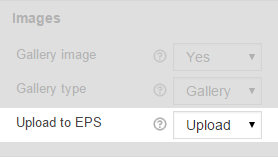 To activate this feature, enable “Upload to EPS” in your profile, which will upload your product gallery images to eBay and their thumbnails will show up below the main image right away. Note: Please note that uploading images to EPS might cause additional listing fees. Check your eBay account after enabling this for the first time.